Kansas linebacker Joe Dineen Jr. (29) and safety Bryce Torneden take down Oklahoma State's Justice Hill on Saturday, Sept. 29, 2018. If the Jayhawks want to put themselves in position to win a Big 12 game for the second week in a row — something the program hasn’t accomplished since 2008 — they will have to first prove they have a defensive solution for the conference’s leading rusher, Iowa State junior David Montgomery. With 100-yard performances in each of the Cyclones’ previous four games, Montgomery arrives in Lawrence averaging 108 rushing yards per game (No. 12 among all FBS players). 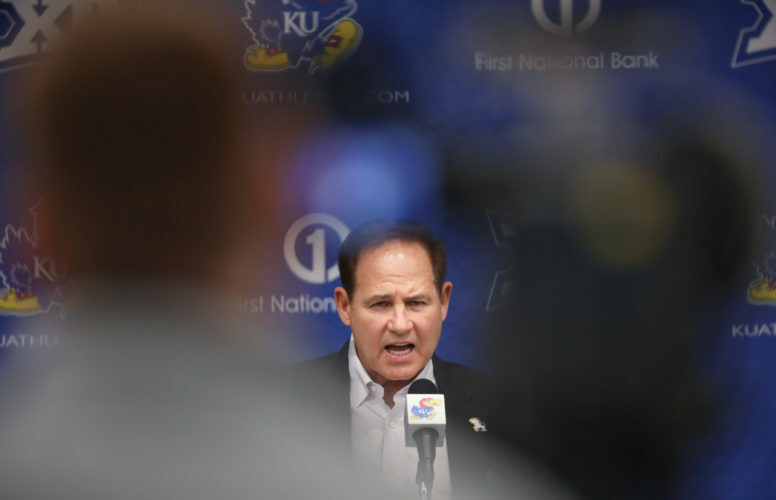 And the 5-foot-11, 216-pound back no doubt fondly remembers his last two encounters with KU, having scored three touchdowns against the Jayhawks in 2017 and rushed for 169 yards versus David Beaty’s team in 2016. An ISU co-captain, Montgomery has at least one rushing TD in each of his past five games. 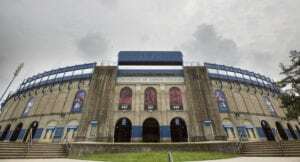 With KU’s primarily three-down defensive front, redshirt senior linebacker Joe Dineen Jr. said the Jayhawks will have to soundly attack the line of scrimmage from the second level when Montgomery gets the ball to make sure he doesn’t pick up chunks of yardage on the ground. 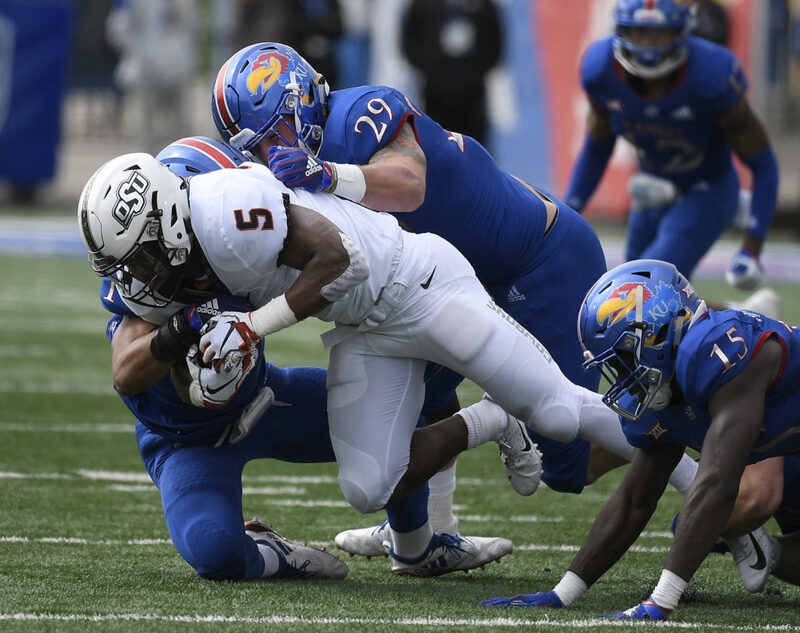 Beaty and his offensive assistants added new wrinkles for defenses to worry about last week, by featuring KU freshman running back Pooka Williams Jr. in the passing game, to the tune of seven receptions and 102 yards. Now, they need to make sure that creativity wasn’t a one-week wonder. It doesn’t matter what KU does to get the ball in Williams’ hands — carries, catches, reverses, whatever works — but it’s imperative that he leads the offense in touches. Seven games into his college career (Williams sat out the season opener), the star freshman from Louisiana has produced the third-most rushing yards of any first-year player in KU history, with 653. Only Kerwin Bell (716 in 1980) and Gale Sayers (865 in 1962) have done better. The offense simply has its best chance of making game-breaking plays when Williams is running and spinning and juking and hurdling in the open field. In upsetting TCU, 27-26, last week, Kansas got 135 yards out of Williams on 18 touches. With Iowa State limiting opponents to 2.8 yards per carry and 98.9 yards per game on the ground this season, the Jayhawks can’t expect automatic success by simply handing the ball off to Williams. The Cyclones are much better than their record indicates. Per the Sagarin Ratings, Iowa State has played the most difficult schedule in the country up to this point, which, as Stats LLC pointed out this week, helped a team with little national buzz debut at No. 24 in the College Football Playoff rankings, despite ISU’s 4-3 record. While the Cyclones are definitely putting up points on their current three-game winning streak — 48-42 at Oklahoma State, 30-14 versus West Virginia and 40-31 over Texas Tech — their defense deserves a lot of credit, too. ISU has held each of its first seven opponents under their season average for yards. What’s more, Iowa State ranks No. 6 in the country in tackles for loss per game (8.3) and 13th among FBS teams in sacks per game (3.1). Over the course of back-to-back wins against West Virginia and Texas Tech, the Cyclones’ defense only allowed three total offensive touchdowns. Junior defensive end JaQuan Bailey leads the team in TFLs (10.5) and sacks (5.5), ranking 19th and 27th nationally, respectively. Had his recruitment played out differently, perhaps true freshman quarterback Brock Purdy would be leading the Jayhawks instead of the Cyclones. 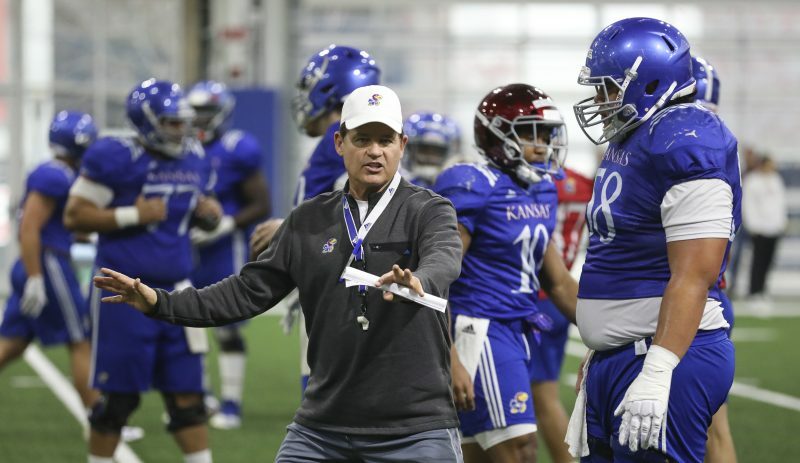 When KU was trying to land Purdy as a high school senior this past winter, Beaty said he was “surprised and shocked” that the three-star QB from Gilbert, Ariz., was still available. “You turn on his tape and you saw a lot of ability in terms of spinning it. He can flat throw it, great release, compact. You could tell he commanded the offense,” Beaty said. ISU’s resurgence this fall has coincided with moving Purdy, a 6-1, 202-pound freshman, into the starting lineup. The Cyclones haven’t lost since head coach Matt Campbell decided to roll with the young pro-style QB. Three games in, ISU is averaging 39.3 points, 461.2 yards and 6.5 yards per play, with Purdy as its No. 1 QB. Purdy has played a role in 10 of ISU’s 15 offensive touchdowns in the past three games. He’s averaging 274 passing yards per game and completing 65 percent of his throws since winning the starting job. 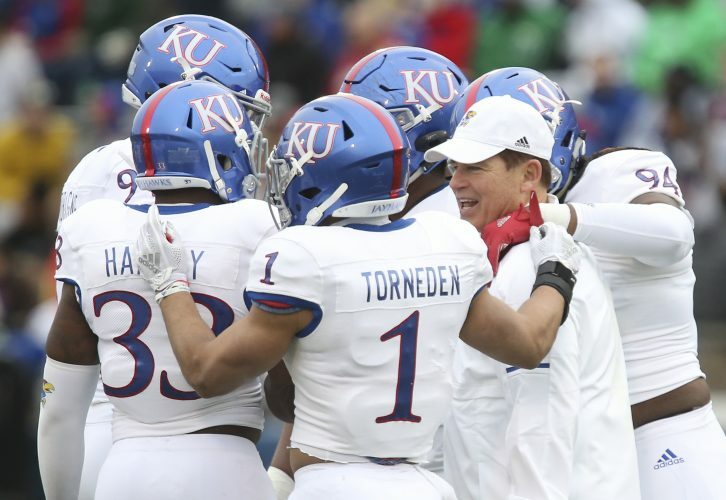 It will be up to KU’s defense, which often drops eight players into coverage on passing downs, to fool Purdy and make him look uncomfortable for a change. The freshman has thrown just two interceptions on 75 passes to date. Although Kansas currently resides at the bottom of the league standings, in a three-way tie for last place in the Big 12 with TCU and Kansas State, many of the team’s senior leaders haven’t lost sight of the fact that the Jayhawks still have a shot at becoming bowl-eligible with four games left to play. Considering the program hasn’t won two conference games in one season since 2008, notching three in November to secure a bowl bid looks from the outside like a nearly impossible task. Jayhawks such as Daniel Wise aren’t wired to think that way, though. 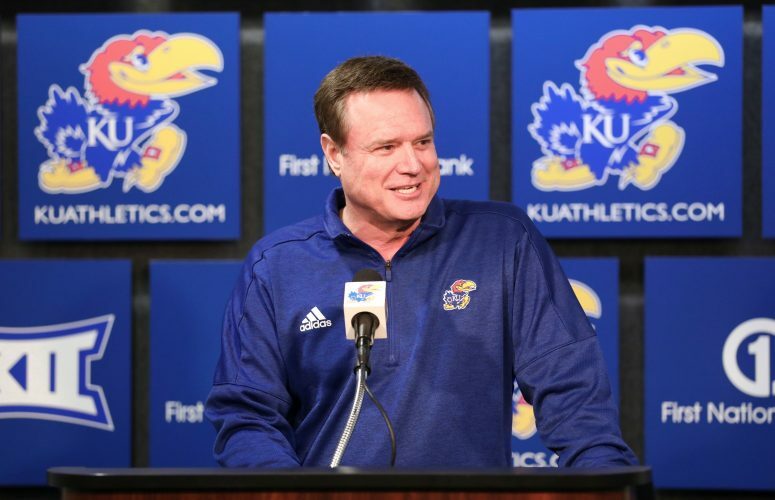 With that as a driving force and carrying some momentum from last week’s TCU win, the Jayhawks enter the final month of the season with some much-needed confidence.